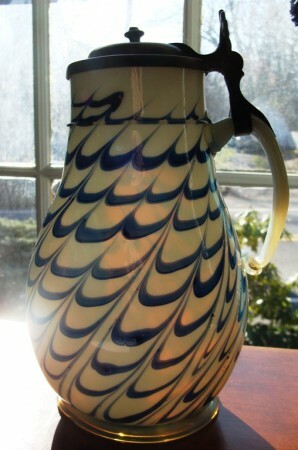 Dated 1769 – These pear shaped jugs are very hard to acquire. 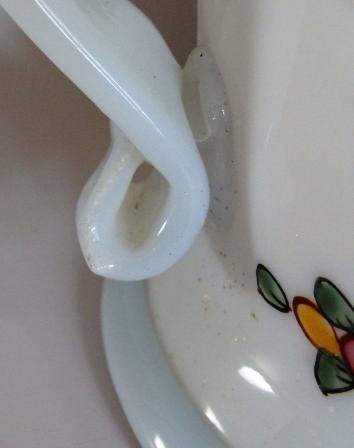 The beginnings of Milk Glass originated in Venice (Italy) in the 16th century. 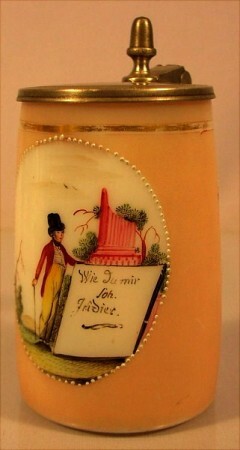 However, back then milk glass came in all different colors including yellow, brown, black, pink and blue. All of these colors still project a ‘milky’ color as the tone is thick and coated. 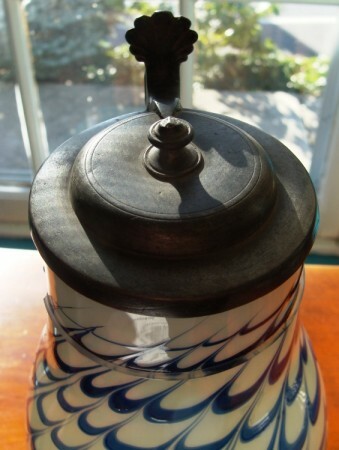 Some of these colors still exist in milk glass, especially blue, but the opaque color remains the most popular. 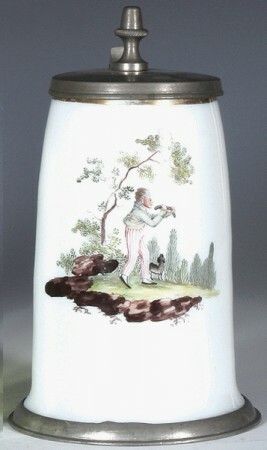 19th-century glass makers called milky white opaque glass “opal glass”. The white color is achieved through the addition of an opacifier, e.g. tin dioxide or bone ash. An excellent photo showing how the base was made and the “pontil mark.” …………………………………………………………………………………………………………………. 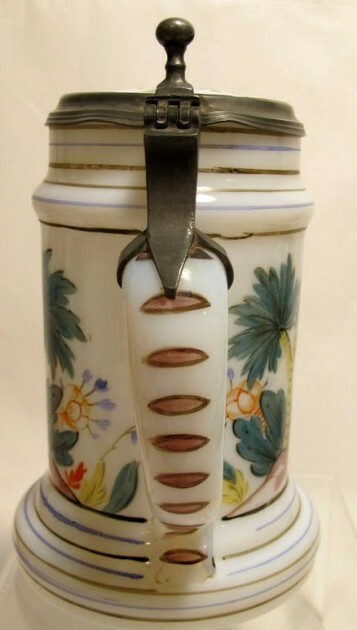 Details – Bottom handle attachment and pewter lid with flared shell thumblift. 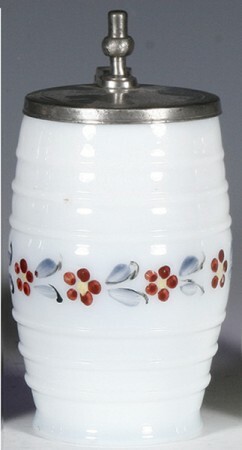 Since the 16th century, milk glass has remained a popular collector’s item as well as a useful item around the house. 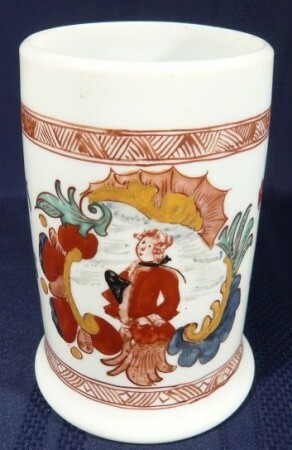 However, most of the collectable milk glass of today dates back to the 1700’s or newer. 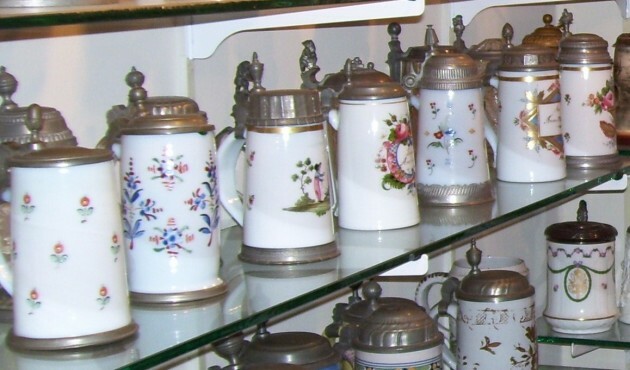 Although milk glass came from the 1500’s, the term ‘milk glass’ did not actually come into play until relatively recently. During the 19th century glass makers referred to milk glass as ‘opaque glass’ and was still considered a luxury item and a great collectable. 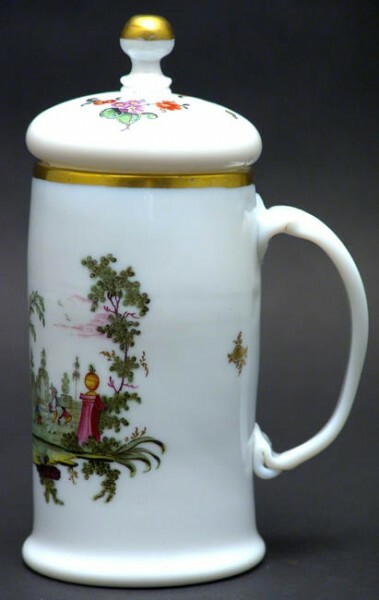 Milk glass became very popular during the end of the 19th century in France, Germany and Bohemia. 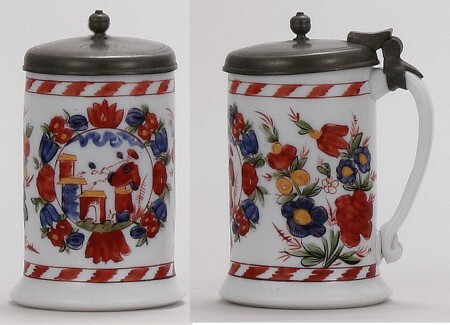 Photos of two of Judy Stuart’s newest “Milk Glass” beer stein acquisitions. Shown above: A very interesting and different scene of a dead red fox. It must have had sone special significance to its owner “A. S.”. 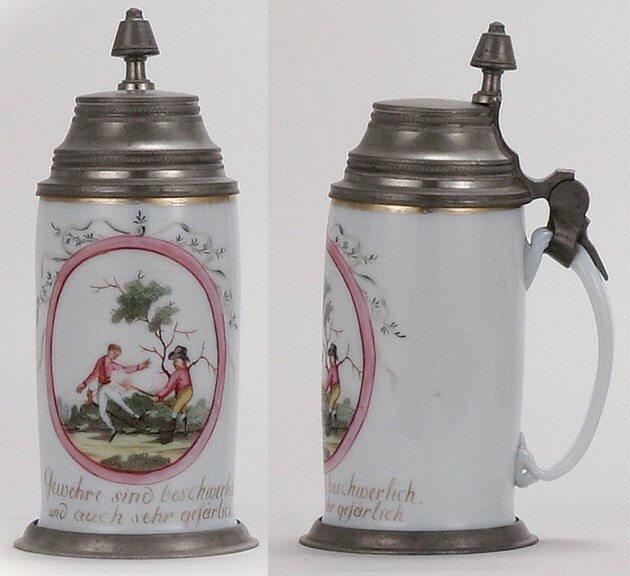 Bohemia and Silesia were the two countries responsible for making the most “German’ Milk Glass beer steins. 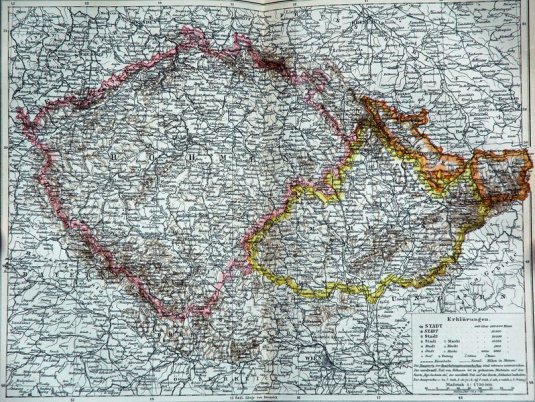 BOHEMIA IN PINK, SILESIA IN ORANGE, MORAVIA IN YELLOW. 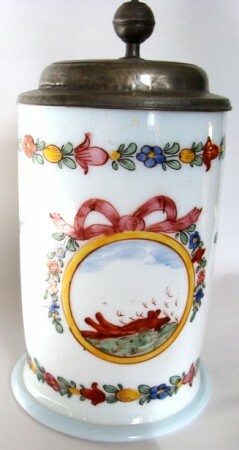 .4L, blown, enameled, Chinese Man with pipe, original pewter lid dated 1792. 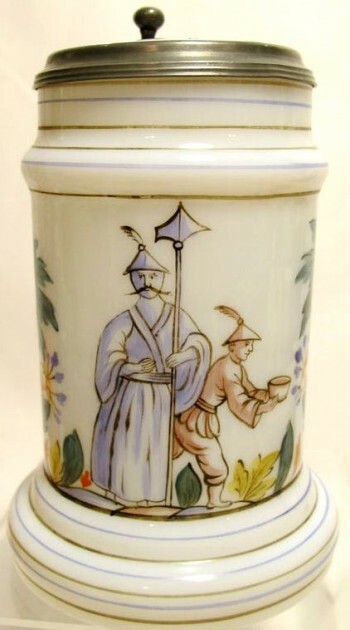 6 3/4 inches tall – An European man with his colonial period, holding his trifol hat. OUTDOORS SCENES = Typical outdoor patterns. 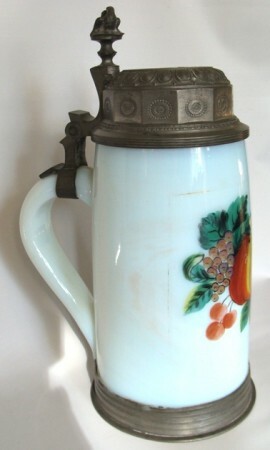 .5L, blown, Early 1800’s, enameled, man & woman. The verse painted in gold is worn. 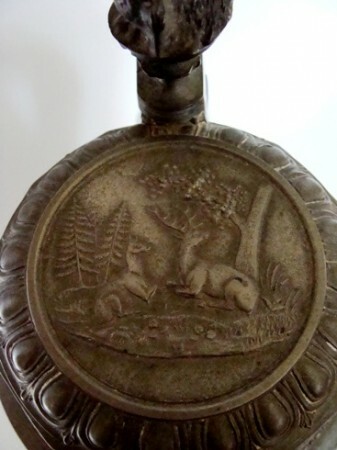 .5L Early 1800s, enameled, “A Vice Presidential hunting accident!” Quite obviously from the same firm / artist as the one just above. 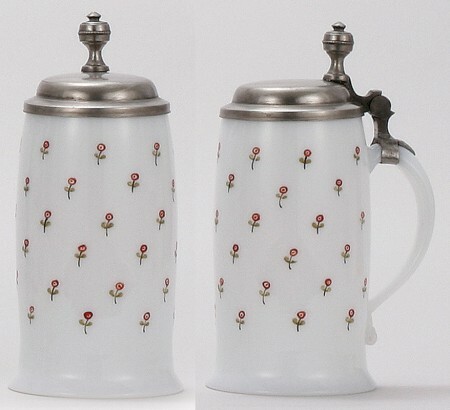 Roses, with other florals as shown on the three steins above were very popular gifts. 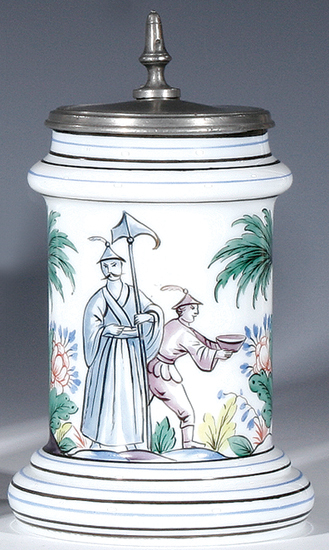 5L, blue milk glass, enameled, “Zum Andenken,” (In Memory), Ca. 1840. 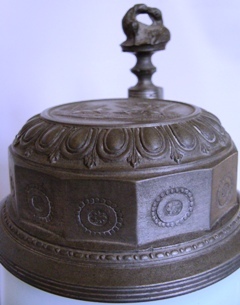 A great pewter “high top” li, and it comes with the thumblift of the two doves kissing which always indicated love / admiration. 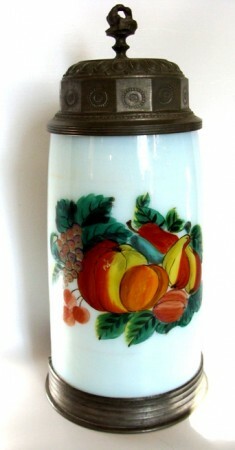 .25L, enameled, briefly floral. This small of a size in Milk Glass is unusual. 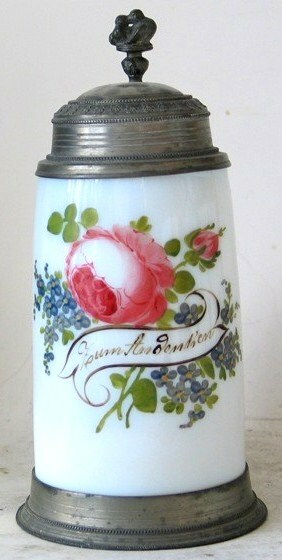 .5L, enameled, flowers, this one has an old replaced pewter lid. 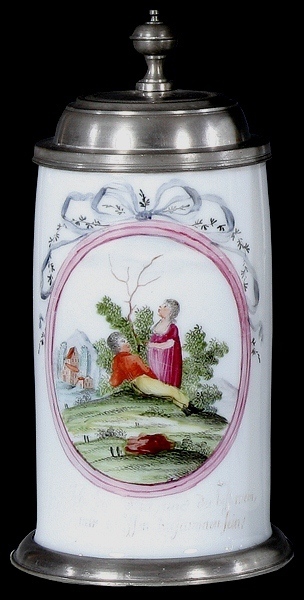 Ca.1820. 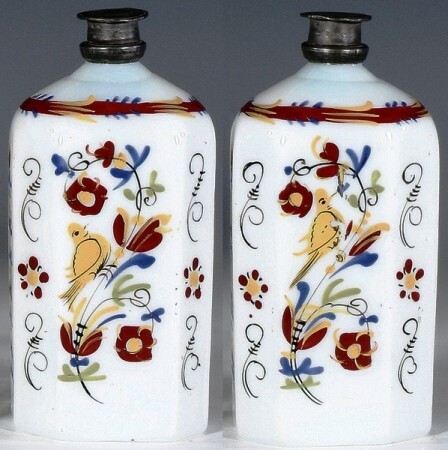 More florals , blown, early 1800s, enameled. Very likely the same artist / workshop. 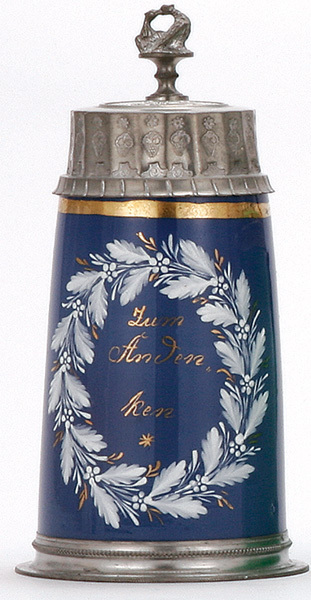 FLASK – Glass bottle, 6.0 ht., blown, early 1800s, hand enameled, flowers & bird, pewter screw top. 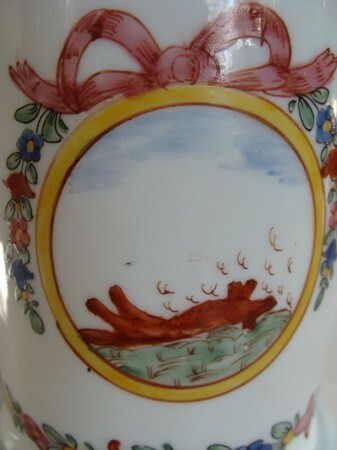 Sometime confused with the old German /Bohemian milk glass is “Old (antique) Bristol Glass” a semiopaque glass of various color tones, notably deep blue, used for decorative glassware and commonly painted with floral and Chinoiserie designs. Bristol, England, glasshouses were established in the 1740s. 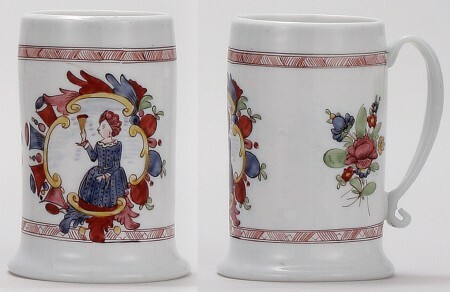 They specialized in decanters, goblets and vases, usually in a cobalt-like blue color decorated with gilding or in opaque white with painted flowers. From this beginning, most colored glass made in Britain became known by the generic term of “Bristol” glass, although not all of it was actually made in Bristol. Of these glasses, the Bristol blue is the most famous. 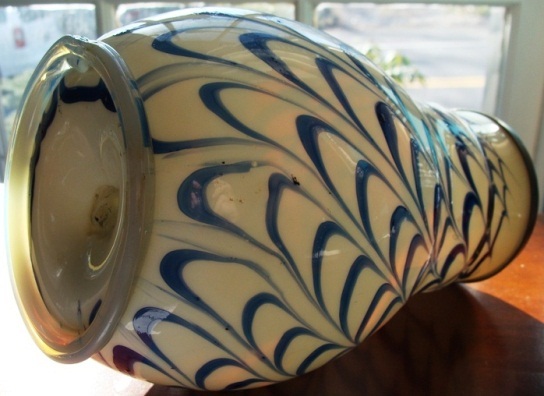 As time went on, a type of semi-opaque opaline glass was made around Bristol..So much Bristol glass was made during the 18th and 19th centuries and it was so inexpensive that it contributed to the end of many glasshouses in America. It is very difficult to distinguish the English Bristol from other opaline types. 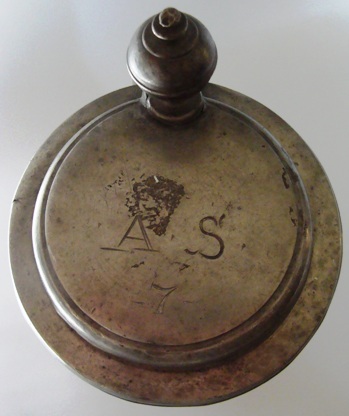 Style, design and decoration are clues for the knowledgeable, but few makers’ marks remain. 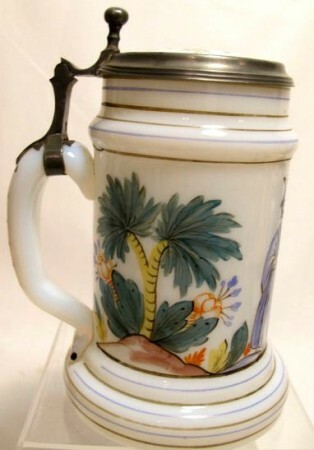 “Old Bristol” Glass Beer Mug Stein, English, “Chinoiserie.” Circa 1850. 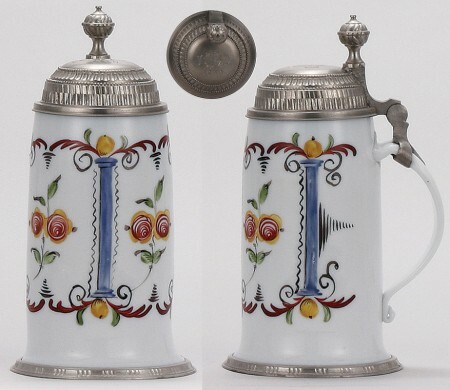 These steins are easily thought to be German due to the fayence type decorations, palm trees, etc., and the painted horizontal slashes on the handles. 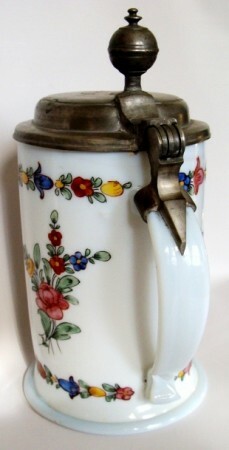 Old Bristol Glass beer stein, .5L, blown, c.1850, milk glass, enameled, pewter lid most likely replaced. Same scene but small differences, mostly coloration.